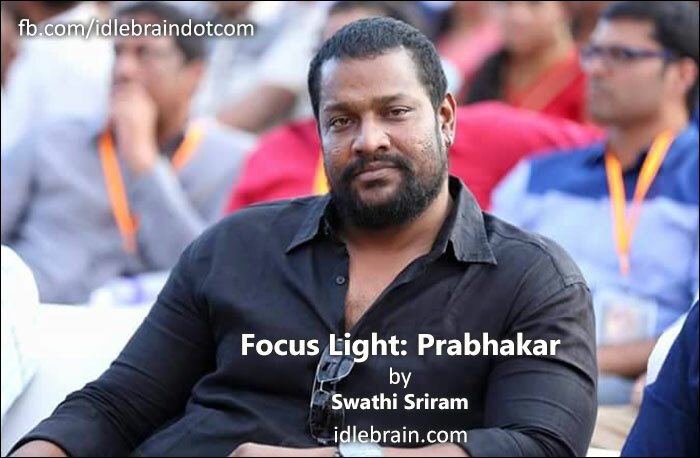 Focus Light is the platform to intorduce and showcase the young talent that is unseen and unheard of in Tollywood. These tinsel stars are shining in the dark. Our effort is to put light on these young talents and bring them into the galaxy of sparkles. He is an example of rags to riches. He plays a villain, but he is the softest of the humans we can ever see. 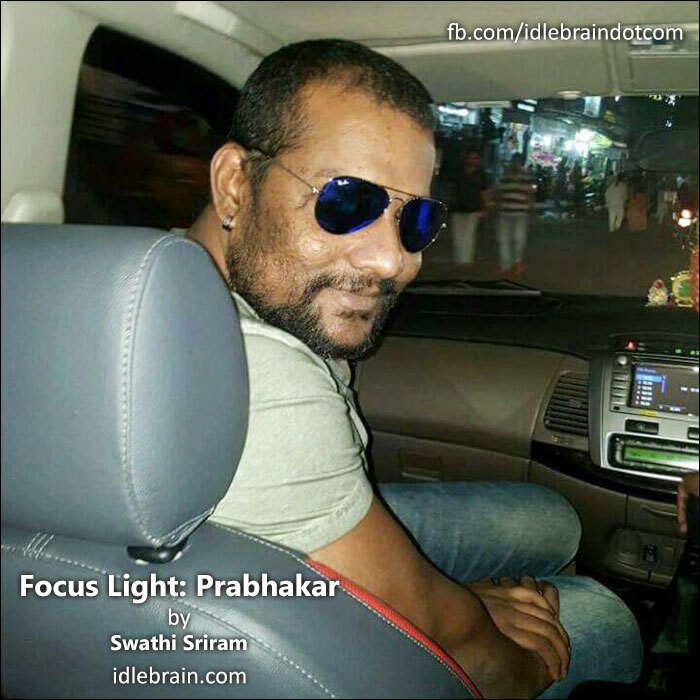 Idlebrain throws it Focus Light on Prabhakar, also known as Kalakeya of Bahubali, who shares his struggles in the industry and shares his two cents. I was born in Hasnabad near Raichur. I studied in Hasnabad and then shifted to Ananta Padmanabha college in Vikarabad. My childhood was quite simple. It was just my parents, myself and my younger brother and sister. As a child, I was very tall and by class seven, I was already 6’2’’ in height. I was the first person to wear pants when rest of my classmates wore shorts. I was quite tall and visible in my group. During my intermediate, my father expired and the burden to run the family, fell on my mother’s shoulder. It was hard for us financially and I had to take up a job to run the house. At this point, I came to Hyderabad for a wedding and one of my relatives asked me to join in police department. Since my built was big, I was suggested that police department would suit me. I used to come to Hyderabad to meet people and join in police department. The travel from my village to Hyderabad was almost 120 km and was quite tedious. The relative of mine who promised me the job in police department took me to Rail Nilayam every day and I waited outside to get a job. I had no money and my mother was helping all of us financially. It was very tough for me emotionally and at one point, my younger brother was earning and I was depending on my mother for my daily expenses. Since I was from a village, the pressure of getting married was also quite high on me. My fellow villagers were making fun of my struggles and unemployment. I felt very insulted. My mother helped me for two years. One day, one of my seniors, Praveen Pogaku, met me and realized I had no money and he took it up on him. He generously paid Rs 1,000 per month, which would cover my Gym fee and rental and food. He did this for 5 years. During this period, a neighbor spotted me and enquired and offered me a job in Tata Indicom. I was very ecstatic and attended the job on day one. The very same day, it was his birthday and in the party, he insisted me to drink alcohol. I never touched drinks or smoked my entire life. When I refused to even take a sip, he fired me from the job. So, by second day, I was jobless! I was in Padmalaya Studios where Surender Reddy’s Atidhi was being shot. I was very curious to see Malaika Arora and was loitering around the sets when Surender Reddy spotted me. My friend suddenly introduced me to him as an artist. It came as a surprise to me and before I realised, I was immediately given dates for the shoot. I didn’t know what dates are and how we do a shooting and what happens on the sets. When I went for the shoot, I realized I was opposite Mahesh Babu in a fight scene. I was placed in the 4th line but Mahesh Babu spotted me and asked me to wield the knife at him. It came as a shocker but somehow I managed it. I was paid Rs 1,200 and it was too much money for me. I thought this was good and took up more movie offers as they came by for daily wages. During Magadheera shooting, Rajamouli saw me for 30 seconds and left. I received a call in one week and was asked to meet Rajamouli. But before that call, his associate director, Jagadeesh, asked me to bring a report of my bone scanning . I thought he was some insurance agent and I avoided his calls as I wasn’t interested and also had no money for any check up. Finally after numerous calls, I met up with Rajamouli who said that he was offering me a chance in his next movie. I immediately said, I did not know how to act. He brushed it off and said that he would teach me how to act. He also asked me how much I earn. When I said, I live on Rs 1,000 per month, he laughed and said he would offer me Rs 10,000 per month and said I need to work hard. He offered to pay my gym fee, got me admitted in acting school, gave me monthly expenses and asked me to attend to the shooting of Magadheera everyday to understand the intricacies of shooting. Most of my expenses were paid by him but the maximum amount that I took in had was Rs 5,000 and not a penny more than that. Then Maryada Ramanna happened but I didn’t reveal it to anyone. When everyone saw the teaser, they were shocked. Shooting for Maryada Ramanna was a learning experience for me. On the First day of the shoot, it was a chasing scene. It was very easy for me as I just ran. Then came the D-day, where I had to deliver the dialogue. I was very tensed. I was stuck. I just couldn’t do it. But Rajamouli helped me a lot. As they say, if you have people who appreciate you, there will also be those who pull you back. Many people on the sets were quite discouraging also. They gave me negative feedback and used to fill my ears with all sorts of stuff. One day I was almost close to crying as I felt insulted by these comments and decided to confront to Rajamouli and leave the shooting. My friend encouraged me and asked me to not to talk anything and just be patient. Finally I finished shooting and I received lot of appreciation for my work. After Maryada Ramanna, I got lot of offers from many movies. As I was financially very down, I had to take up the offers. Gabbarsingh, Doosukelta, Dookudu, Krishnam vande jagadgurum, Dongata were few of many movies that brought me some recognition. I have acted in almost 40 movies, but only 20 gave me good exposures. I never met Rajamouli and Rama after Maryada Ramanna. I didn’t know how to approach them or even talk to them for movie roles. But I always wanted to talk to them. I was working for a Tamil movie in Tiruchi. There is a Balaji temple in that city. I used to wait near the temple thinking- Rajamouli would come or call me as I heard their team was in Tamil Nadu during that time. I rented a room in agraharam opposite the temple thinking I could see him one day. I would pray everyday and wait desperately outside the temple for their glimpse. We were shooting for Attarintiki Daredi during that time. And as cosmic as it could be, my phone rang and it was Rajamouli’s call. But I did not lift it as I had cold feet. After I finished the shoot, I called back and was asked to meet him after a week. He offered me a role and told me that I need to practice fight for one month. After 1 month, I was given make up test. The make up was tough and achy but when I went in for final touch up, everybody was surprised. That day, Rajamouli announced that he found Kalakeya! I always wanted the director to narrate a story to me. When I read other’s stories of how directors approached them and narrated them the stories, I wished I had that day. Now, Rajamouli called me in and narrated the whole character of Kalakeya. I can never forget that moment and now I also have a moment to share. I still cherish those few hours that I spent during story narration with Rajamouli. The make up was quite achy and tough to wear. And the language, Kiliki was tough to learn and memorise. It was a unique challenge for me. For someone who never saw camera and became an actor by accident, memorizing a language that didn’t exist and wearing make up in that hot sun was as tough as it could get. I practiced the dialogues and added my own modulations to it. Everyone appreciated me and I thoroughly enjoyed delivering the dialogues and acting as Kalakeya. The role was strong and I was playing equal to Bahubali. 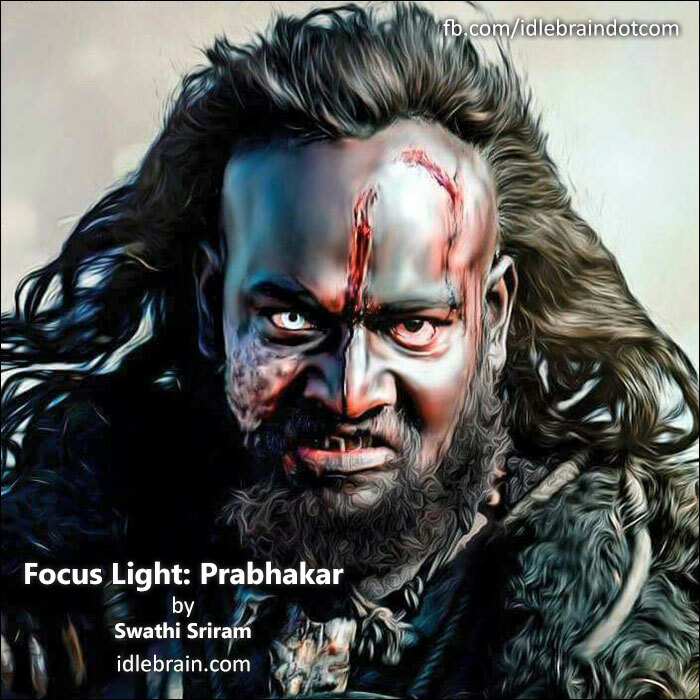 The shoot was tough and on the last day of the shoot where I was dragged by Prabhas, my body sulked and I had fever due to the vigorous fight scenes. But everything paid off and my life has changed entirely. Nobody was happy meeting me or even knew me before. Now, I am now called by everyone; as a celebrity. My life is in two phases now. Before Bahubali and After Bahubali. I am thoroughly enjoying my phase now. I have seen the worst hardships and I am sure many people might be facing them in one or the other forms. For anyone to achieve heights- hard work, discipline and punctuality are every important. Without these three, there is no shortcut to success. I worked in more than 40 movies and never I had a single issue with any manager or the director. One needs to know what to talk and what not to. This field gives us power. But humility is very important and I have always maintained my decorum. Also, I do not have any habit of drinking, smoking or gambling. It keeps our soul clean. And also saves lot of money. I faced the worst financially crisis in my life. So, I know the importance of money and I can never let money go wasted. I never forget my grass roots. Frankly, I never saw a lakh of rupees. I only knew hundreds and thousands. At the same time, I never even asked money from anyone. I knew what I went through. But by god’s grace, I have little to adjust with now. One needs to know how to be patient. Also, we should never make excuses. If our body hurts, then we might as well stay calm and deal with it, than complain about everything. Excuses won’t fetch us anything in life. My wife Rajya Lakshmi is a homemaker. She is very kind and understands me a lot. At the times, when I couldn’t fetch for my family, she managed the house without any disturbances. We have two sons. Sriram Rajamouli and Ritvik Preetam. Rajamouli and Rama are also my family. They found me in rags and polished me. If I am what I am today, it is totally because of them. They treat me like their own child and with that love, I have even named my son after him. Many people ask me not to say this; as other directors would not give me a chance. But, why not? They gave me life and I owe it to them a lot. I feel proud to claim and I say it loud that he is my god. I am now choosing my roles carefully and hoping to make it big in Tollywood. I am here to stay and give my best.